Anhui province is dissected by two important rivers, Huaihe in the north and Yangtze in south. Its remarkable landscape, flatland in the north, mountainous in the southwest, and hilly area in the southeast, has made Anhui province a diverse and high production yield origin of TCM herbs in China. According to National Chinese Herbs Investigation, a total of 3,482 herb species was collected in Anhui in 2005, which ranked no 6 in herb species quantity in China. 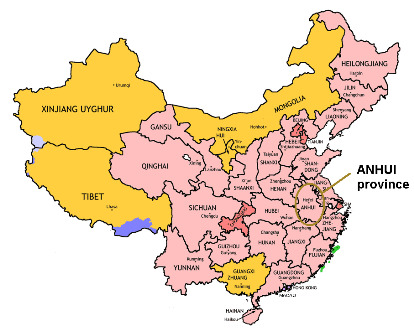 The resource of popular dao di Anhi Chinese herbs including cultivated Shao Yao (peony), Bai Zhu (white astratylodes), Jie Geng (platycodon), and Ban Lan Gen (isatis root) in the northern flatland, Tian Ma (gastrodia), Fu Ling (poria), and Ling Zhi (ganoderma) in the mountainous region in southwest, and Mu Dan Pi (moutan) and Ju Hua (chrysanthemum) in the hilly region in southeast. Bozhou has a long-standing history of over 4,000 years and the city has the reputation of "The Capital of Medicine”. Since the end of Eastern Han Dynasty, Bozhou residents started to cultivate and distribute Chinese herbal medicine; the business has flourished for more than 2,100 years. In Pharmacopoeia of the People's Republic of China (PPRC), four herbs are named after the City of Bozhou, which are Bo Shao (peony), Bo Ju (chrysanthemum), Bo San Pi (mulberry bark), and Bo Hua Fen (trichosanthes root), in which Bo Shao and Bo Ju are recognized as the four great medicinal herbs of Anhui. About 75% of China’s Bai Shao is produced in Bozhou. In 1995, Jiang-Zemin, the General Secretary of the Communist Party of China, left a dedication to the place as the “hometown of Huatuo, homeland of medicinal material", which further elevate the popularity of Bozhou herbs. Replenish qi (energy) and regulate immune system. Blood deficiency, chest, abdominal, flank and costal pain, muscle pain and tightness, spasm of the limbs, diarrhea, dysentery, fever due to yin-deficiency, menstrual disorders, painful menstruation, functional bleeding, leukorrhea, spermatorrhea, dry skin. Internal liver wind, pain due to wind, wind-damp Bi painful obstruction, headache, dizziness, vertigo, convulsions, seizure, epilepsy, hemiplegia, chronic numbness, weakness of extremities, contracture of the limbs, sore and painful knees and waist, aphonia, arthralgia due to wind, cold and dampness, convulsions young children. Blood level warm febrile diseases, hematemesis, epistaxis, macula, epilepsy, abdominal pain, yin deficiency bone-steaming from extreme fatigue and fever, menstrual disorders due to blood stasis, masses, lumps, dysmenorrhea, gynecological disorders, traumatic injuries, bruises, eye pain, liver heat headache, flank pain, sores, intestinal abscesses, no sweating. Warm febrile diseases, mumps, damp-heat jaundice, carbuncles, erysipelas, swollen and sore throat, hematemesis, and epistaxis. Cough, various types of sore throat, tonsillitis, loss of voice, voice hoarseness.